I recently joined the newly formed Buckland St Mary community choir. We are a motely bunch. There were no auditions – it’s just turn up and sing your heart out. To start with we didn’t have a conductor and would just sing along to a CD. We tried to get Gareth Malone to come along and put us through our paces. Unfortunately he wasn’t available, but now we have the lovely Penny to lick us into shape. She is getting us to sing in rounds and in harmony so we are starting to sound good. On Friday we had our last practice before our first public performance at the Buckland St Mary church carol service on Thursday evening, but unfortunately we were down in number as quite a few people had colds. We didn’t stay long. Neil has been full of cold all week so he couldn’t sing, and I want to be well enough to sing on Thursday. 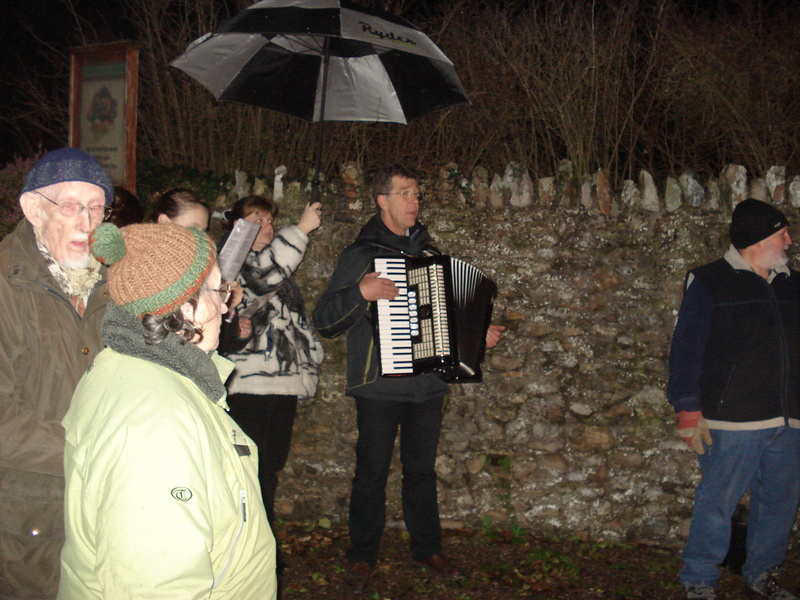 I love singing carols so was sorry to miss out today. We have been to two Christmas carol services in the past few days. The first one was at Buckland St Mary church on Thursday evening. The children from the Buckland St Mary C of E primary school led the proceedings by coming in by candelight, singing “This little light of mine, I’m gonna let it shine” – very cute. 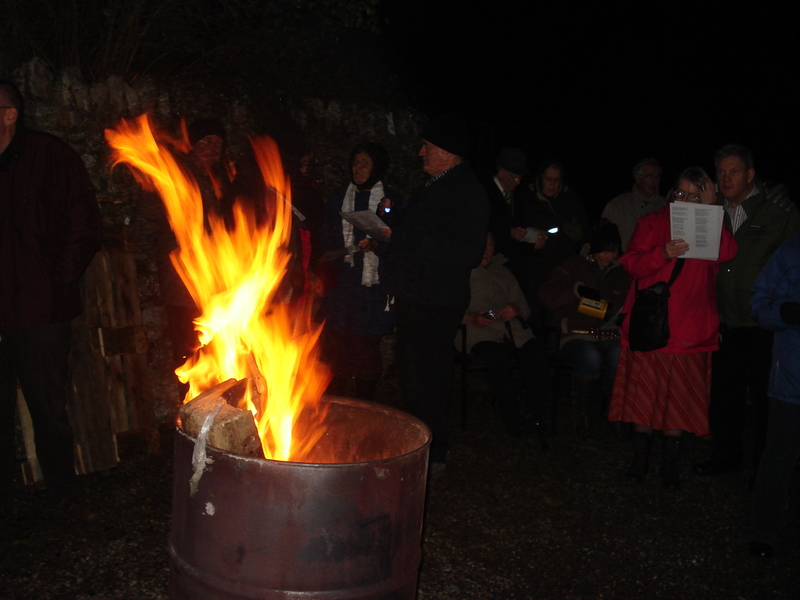 We then had various carols and readings, some by children and some by parishioners. The children sang “Oh Little town of Bethlehem” to a different tune to the one we know!! It’s jolly cold in Buckland church, so we had to wrap up warm, and after the service we were offered mince pies and hot mulled wine. Then on Sunday (yesterday) we went to the Bishopswood village hall for the 3pm carol service organised by the free evangelical chapel in Bishopswood. This was quite an informal affair, with people sat around tables which were decorated with Xmas trees or baubles and a dish of Quality Street sweets!! Again we sang several carols and there were readings and a georgie poem about Xmas read by the new pastor. We were reminded by the pastor of the true meaning of Christmas, which can sometimes get lost amidst the presents and decorations and commercialised hype at this time of year. After the service there was a feast. I had been asked to make a cake, but there was lots of savoury dishes, quiches, sandwiches etc followed by lots of different types of cake and desserts such as trifle and cheesecake. There was so much to eat that when we came home we decided we were too full to have dinner last night!! Lots of people attended both services and which one did I prefer? Both really, had their own merits, so I didn’t have a favourite. It’s just nice participating in events held by the local community.